It doesn’t matter that the NFL off-season is in full swing, with the combine winding up in Indianapolis, free agency set to begin in a few weeks and more than two months of draft hype staring us in the face. It’s still open season on the Cleveland Browns and the smoldering ruins of the former front office. The latest report comes courtesy of Pat Kirwan at CBS Sports, who cites an unnamed league source as saying Browns CEO Joe Banner wanted offensive coordinator Kyle Shanahan and defensive coordinator Jim O’Neil to report directly to him rather than to head coach Mike Pettine. Kirwan calls the situation that Banner wanted to set up “atypical,” which is being generous. It’s ridiculous and, as Kirwan later pointed out, makes it appear as if Banner wanted control over which players actually saw the field on game day. While that falls in line with reports that Banner was mad at former head coach Rob Chudzinksi for not playing rookie corner back Leon McFadden more, it still is very bizarre, even by the standards normally set by the Browns. Just like last week’s report that the Browns were trying to trade for San Francisco head coach Jim Harbaugh, it’s not hard to see how former general manager Mike Lombardi would be the “unnamed source.” He has an ax to grind with Banner and would probably have no hesitation about throwing Banner under the bus. Despite all the nonsense surrounding the situation in Berea, Banner may reportedly land on his feet just fine. 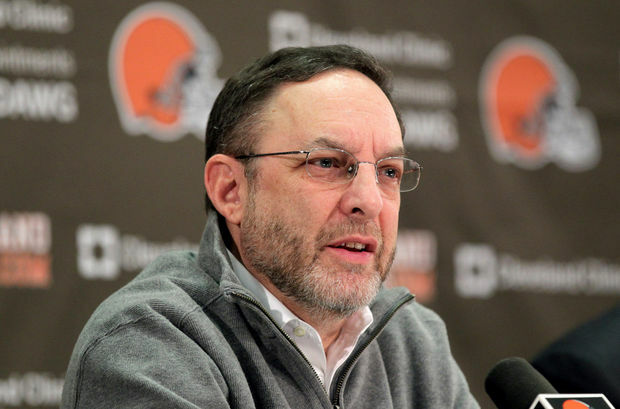 According to a story on Philly.com, Eric Grubman, the NFL’s executive vice president of business operations and the man who introduced Banner to Haslam in 2012 (so you know who to blame), is trying to talk Banner into taking a job with the league office. In the story Banner is quoted as saying he plans to take “four to six months” off after he is done transitioning out of his role with the Browns. After Kirwan’s report Haslam should let Banner get started on that plan tomorrow. Any possible benefit he may still bring to the Browns is minimized by stories like the one Kirwan reported. In the meantime, all Browns fans can do at this point is laugh.